Over the past decade plus, Indianapolis taxpayers turned Indianapolis Colts owner Jim Irsay from a mere millionaire into a billionaire. Then, a few years ago when the Capital Improvement Board, the public entity which runs the venue where the Colts play, Lucas Oil Stadium, was bleeding money, the CIB went to Irsay and asked him for $5 million a year back on the ultra-sweetheart deal he got on the stadium, the very deal that made him a billionaire. That way the CIB wouldn't have to ask that taxes be raised on Marion County taxpayers who were in the middle of the Great Recession. What was billionaire Irsay's response? Screw the people of Indianapolis, a deal is a deal. The Colts told Fox59 that games that are not sold out this season will be blacked out despite new NFL rules. Currently, there are still around 2,000 season tickets available--something the team is not used to. Normally, a game that is not sold out would be blacked out per the old NFL blackout rules. Those rules were put in place to make sure fans attended games. Recently, the NFL announced it's changing those rules, minimizing the chances fans would miss watching their team play. Instead of having to sell out to be on TV, the home team would only have to sell 85 percent of its tickets. It would be up to the team to decide if it would air the game. The Colts, however, are sticking by the old rule: all tickets must be sold or fans can't watch the game on TV. "We're confident that the games are going to sell out this year, but if for some reason one didn't, then obviously the blackout rules would still apply," said Hall. "Obviously the blackout rules would still apply?" Notice the dishonest response by Hall...suggesting that by blacking out the games the team would be just following NFL blackout rules. As the story explains, the team doesn't have to black out games if it is 85% sold out. The fact that there are only 2,000 tickets remaining means far more than 85% of the tickets are sold out. The fact that Jim Irsay is a complete jerk of an owner who cares nothing about the community his team plays should be a lot more clear since the people's vision is no longer clouded by Irsay consistently fielding a play-off caliber team. Now if they would only televise a better (won't be hard this year) team then the Colts. Being Packer fan I would love to see more Packer and Bears games. Get a antenna on top of your house and you may be able to pick up Lafayette channels that might switch to another team if they can't show the Colts. I told everyone two years ago on a few forums that blackouts were coming this year. Oh, I was despised, but I was right. Then Irsay will look to move to the new L.A. stadium. Guy, I want the Raiders. This is why the vast majority of us who had our own teams before the Colts moved here never converted and why thos ewho move here from other cities tend to not convert as well. The Irsays have always been jerks. And the Colts have interefered with out ability to watch our own teams. The NFL wants, eventually, to put pay-per-view or some variation in everyplace. What Irsay has done in this instance is reprehensible. The Colts sold season tickets last year with full knowledge that Peyton Manning would be out. I am not sure that Irsay would go to L.A. for a new stadium deal. People in L.A. have a lot of leverage. They also have had to deal with Al Davis in the past. They probably would want someone more dependable. After all, the Colts only have been here, what, 29 years? That's not a lot of years for a billion-dollar (just a wild guess at a price) stadium. Governments should not build facilities for privately-owned sports franchises. Mark, I truly think Irsay wants L.A., and he's boxing Indianapolis into a corner. After so many blackouts, he can claim the town isn't supporting the team, and off he'll go. He played hardball with the fans on letting Manning play the last two games of last year, which Manning wanted to do but was denied; he played hardball with the fans on season ticket renewals, all the while knowing that Manning wouldn't be around to give those tickets any value; he played hardball with the city in threatening to leave a few years ago and in giving some money to the CIB so taxes wouldn't be raised, and he's playing hardball with the city over blackouts. To him, Indy is nothing but a cash register. After he moves to L.A., there's really nowhere else for him to go, as the league won't let the carpetbagging team pick up a third time, so he knows he'll be stuck in L.A., and he's fine with that. The NFL, or more specifically its advertisers, will always keep the sport from going to pay-per-view. Yes, governments should not build facilities for private teams, but conservatives are liberals and socialists who believe that public resources should be spent on private enterprise to produce an economy that benefits the most people. This is, of course, collectivist blatherscat, but such leftism is the American conservative. so you missed the rest of the story? If team agrees to 85% rule, they pay 1/2 of ticket revenues to other team for anything above 85%. No team that usually sells out is going to agree to that. That amount of money is a pittance. NFL teams make their money from the TV contract. You can scream till you're blue in the face about government building a stadium for a private business, but that argument hasn't flown for thousands of years and still does not. The Roman Colosseum and the numerous Roman and Greek amphitheaters stand as proof. Stadiums (stadia?) are generally just too expensive for the vast majority of team owners. Always have been. I'm no fan of the Irsays or the Colts, as you know, but I don't think you're being fair. Peyton Manning's status was unclear until the end of last summer. Even if it was clear, what are the Colts supposed to do? Stop selling season tickets? Stadia is the correct plural form. Then let the teams play in a farm, Cox. They're not entitled to any particular form of playing grounds. It's not the public's job to let Republicans steal their money to give it to their corporate friends. Of course, the Republicans like this arrangement, as it keeps the public distracted and less likely to notice the corruption the party scum are committing. If the public votes to pay for the stadium, as they did in Cleveland (twice) and Cincinnati, for instance, then, yes, they are indeed entitled to a particular form of playing grounds. In fact, the majority of stadiums throughout history have been publicly funded. You may not like it, but the public has spoken over thousands of eyars. Just accept it. No, Cox, the public is never entitled to vote away their neighbor's dollar to hand to a private party for a private benefit. There is absolutely no moral justification behind mob rule. An action is not moral merely because a majority prefer it. That's a hellish moral and political system you've permitted, a system entirely unknown to our Founders. Kids used to be taught right and wrong in schools. How far we've fallen. Sales of tickets to sporting events will continue to drop as the venality of the business increases. Indy was stupid to build its two palaces for the Pacers and the Colts and will suffer the consequences for decades. Wow. Using public money to build a stadium is "hellish?" Exaggerate much? BTW - Americas Founders based our system on a legal tradition that dated from Greece and Rome through Britain. So, yes, they were quite familiar with spending public money for big projects. It is theft - theft is hellish to those who have been stolen from. LA would never let Irsay own the team - the LA people want to own it - Irsay would not likely ever sell unless he decides he'd rather buy a small island and tweet his life away. Cox Quote: "Wow. Using public money to build a stadium is "hellish?" Exaggerate much?" Your shallow analysis is truly terrifying. The mechanism by which private money is handed directly to a private party, for the sole profit of the private party creates and sanctions government without bounds. If this manner of outright theft is permitted, what isn't? Where, exactly, are my restraints upon the government? Governments derive their just powers through the consent of the governed, but I never consented to this, and it is in no way just to enrich Irsay merely because Cato happened to conduct commerce in Indianapolis. My dinner bill is in no way connected to a desire to fund football, yet thieves with guns have joined the two disparate activities. This is rightly called hellish, but to a confiscatory collectivist, nay, fascist, this is a good state of things. Cox further said: "BTW - Americas Founders based our system on a legal tradition that dated from Greece and Rome through Britain. So, yes, they were quite familiar with spending public money for big projects." What a feeble extrapolation. That America followed Greece, Rome, the Hittities, the Mycenaeans, etc. is not an incorporation of their legal systems into ours, and nowhere did our Founders consign the public to repeating the sins of prior governments. That argument was a breathtaking red herring. Further, I'll bet the Romans didn't hand the Coliseum over to the private ownership of Stultus Irsaeus I. Nor did they tear down the Coliseum after 30 years to build another. I'd feel better about the Hoosier Dome Part 2 if it were publicly owned and Irsay paid fair-market rent for each game, covered all game-day utilities and cleaning, received no naming-rights revenues and received no revenues on any date that his team wasn't playing there. You seem light on the historical knowledge, so I'll let you in on a couple little secrets. 1. Democracy was invented in Greece. Athens, specifically. 2. Republican government, an evolution of Athenian democracy, came from Rome. 3. Our founders were well aware of both, since they incorporated the republican concept into our constitution. Hatti and Mycenae had nothing to do with it. 4. 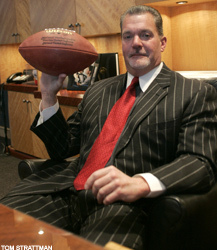 Irsay does not own Lucas Oil Stadium. He rents it. Technically, anyway. Ownership of the stadium is with the CIB. Now the lease is so bad that we end up paying him but it is still just a lease. 5. Lucas Oil Stadium hosts more than just Colts games. Cleveland) in voter referendums to spend public money on stadiums and arenas. Your side had a chance to make its case. You lost. This is why libertarianism as it exists now will never catch on in the US. You want little more than the law of the jungle. You don't care what the people need or want. You don't care that not every problem can be solved by the private sector. If anything involves government you automatically say no. Cox, you've again authored another page of nonsense in a flailing attempt to save face. I have little desire to crush your head like a tangerine on a golf tee, so I won't waste my time or degrade myself responding to each and every embarrassing red herring and non sequitur you embarrassingly employed. I will take a moment to address a particular metaphorical error you regularly employ. You analogize libertarianism to the "law of the jungle," by employing this nebulous phrase without definition or clarification. From this first, this phrase makes no philosophical sense, as the jungle has no humans, therefore it can have no laws, as laws can only exist in the presence of humans. Exploring your strained metaphor a bit further, you seem to be claiming that "the law of the jungle" i.e., libertarianism, is of the wild because libertarians believe that no man may take from another man without that man's consent. As usual, you have it precisely backwards. In the jungle, a creature takes whatever it wants, whenever it wants, from any other creature. This state most accurately describes the Republican Party and other noxious statists who do take whatever they want, whenever they want it, from whomever they want. Republicanism is a savage, lethal, imprisoning jungle. Libertarians stand in complete opposition to every bit of this, flatly opposing taking anything from anyone without the others' consent. Skip the metaphors, Cox. You can't use them well, and you're nonsensical when you play with them. Metaphors are an imperfect tool, in any case, but when used, only the best craftsmen can employ them with decent effect. You conclude with this bit of arrogance, haughtiness and paternalism: "You don't care what the people need or want." Indeed, I don't. Neither do you. Neither does anyone. Stay out of the wants game, Cox, because you damn sure have no idea what I want, and it's arrogance to think a lowly being such as yourself is fit to satisfy the wants of the rest of us. More specifically, what I do want is an absence of you. In the jungle, I'd be able to cure that annoyance, but since there's a kernel of libertarianism yet in our government, you're eternally permitted to be an irritation upon us all.